We’d love your help. Let us know what’s wrong with this preview of U.S.S. Enterprise Haynes Manual by Ben Robinson. To ask other readers questions about U.S.S. Enterprise Haynes Manual, please sign up. Now I will admit a serious amount of fan boy came in to play here (along with the Klingon Bird-of-prey) manual. Now where do I start with my guilty secret - no seriously Star Trek has played a massive role in tv (and film) culture, has influenced countless others and proves it is still as popular and creative now as it was back in the 60s. But back to the book. This book covers off all the various versions and generations of the USS Enterprise so really there is something here for every fan (apart Now I will admit a serious amount of fan boy came in to play here (along with the Klingon Bird-of-prey) manual. But back to the book. This book covers off all the various versions and generations of the USS Enterprise so really there is something here for every fan (apart from the latest version from Mr Abrams). The book takes a similar approach to all their Haynes manuals so if you have read any of their other titles you know what you are in for - part technical part history. What I do love about this book and I must praise them for is the consistent level of artwork through out the book. Many of this type of book calls upon material already out there - and such you can imagine the quality and styles vary a lot. However here its consistently high in standard and does feel like it was all from the same source giving a subtle level of authenticity not often found. So what can you say - for those who are not a fan its an intriguing book to flick through for a fan like myself its a great nostalgia trip and smug smile in thinking someone went to all this effort. This is a great overview of all the ships that have carried the name Enterprise. It is very heavy on the 1701 (from TOS) but I suppose that is to be expected. And it is one of the only ones that did not get destroyed in glorious battle. The pictures are great too. A look at all the starships to bear the name Enterprise, from the NX-01, up to NCC-1701-E.
Each ship is well described, brilliantly illustrated with cutaway diagrams and detailed labelled pictures of all the main parts. The history of each ship is then described and various parts of the ship will have a more in-depth write up. The original NCC-1701 (original series) and Enterprise-D (from The Next Generation) seems to get the lion's share of the book compared to the others. Not an issue by itself, A look at all the starships to bear the name Enterprise, from the NX-01, up to NCC-1701-E. The original NCC-1701 (original series) and Enterprise-D (from The Next Generation) seems to get the lion's share of the book compared to the others. Not an issue by itself, but would have been good to see the others get a bit more detail. If it's just Enterprise-D you want to know about then Star Trek The Next Generation: Technical Manual is a lot more detailed. Along the way there are also looks at parallel universes and how transporters work. There’s always been something about the U.S.S. Enterprise that made me want to go to there. Whether I was geekily devouring Star Trek novels that went to unexplored places on Captain Kirk’s Enterprise, or hoping the Borg wouldn’t completely assimilate Captain Picard’s, or later, cringing as the Next Generation Enterprise crashed into a planet’s surface in the movie Star Trek: Generations. Because as much as any individual member of an Enterprise crew was important to the stories being told, so w There’s always been something about the U.S.S. Enterprise that made me want to go to there. Whether I was geekily devouring Star Trek novels that went to unexplored places on Captain Kirk’s Enterprise, or hoping the Borg wouldn’t completely assimilate Captain Picard’s, or later, cringing as the Next Generation Enterprise crashed into a planet’s surface in the movie Star Trek: Generations. Because as much as any individual member of an Enterprise crew was important to the stories being told, so was the starship. It’s not “the voyages of Captain Kirk,” it’s “the voyages of the Starship Enterprise,” and I love almost every version of that ship. That crazy, geeky love is celebrated in the U.S.S. 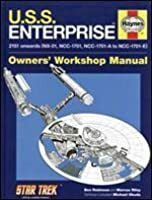 Enterprise Haynes Owners Workshop Manual. 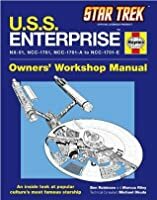 Styled like the famous automotive repair manuals, and licensed by both Paramount/Star Trek and Haynes, it’s an entertaining read for anyone who has ever overthought the layout and technical specifications of any version of the Enterprise. Written by Ben Robinson and Marcus Riley, with some assistance from long-time Trek advisor Michael Okuda, the 160-page hardcover gives a chapter to seven different starships that have borne the Enterprise name. Each chapter has an Operational History and Systems Overview—basically an explanation of that starship’s history as it was seen in the television series or movies that it was featured in, but retold in a faux-historical tone. 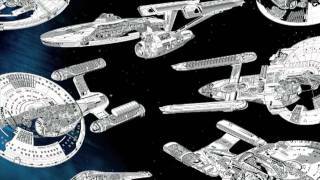 Four of the starships get a great deal more detail: Captain Jonathan Archer’s NX-01, Captain Kirk’s NCC-1701, and Captain Picard’s NCC-1701-D and NCC-1701-E. This makes sense, because they’re the ships featured in the television shows and movies, where the others (NCC -1701-A, B, and C) were only seen briefly. Each of the main starships gets several pages showing and describing the most-seen areas of the ship: the bridge, transporter rooms, sickbay, shuttlebays, engineering, crew quarters and holodecks. The illustrations include photos from the television shows and movies, but also new drawings and renderings that give more technical cutaways and exploded views showing how the ship systems would “really” work. There are several sidebars and inserts that give more details that would have applications not just for a single starship, but across the entire Star Trek universe established in the various television series and movies—things like how faster-than-light “warp” speed works, how time travel was achieved, and how deflector shields and transporters work. There’s a great size comparison chart at the end that I’d love as a poster…I should get on that. This is the kind of book I would have loved and pored over as a kid, and as an adult, I devoured it all in one sitting. It’s a nice tribute to the imagination and the reality of an enduring series, and the fans who have kept the love of the U.S.S. Enterprise alive. Very impressed with this book of the Starships Enterprise NX-01 to Enterprise E.
An excellent overview of all the different Enterprises. Includes details of ship layout, cross-sections, and overview of each ship's time in service. A wonderful companion guide for fans of the television series, movies, or novels. This was a pretty fun novelty book. Set up to act like the many automobile repair guides put out, this book touches on the history, layout, and design of the various starship Enterprises from the various Star Trek movies and television shows. There are lots of really fun graphics and cut out images to give a good sense of where everything is located. Much of this was familiar to me, but some of it was new, particularly with regard to the Enterprises B and C.
I'm a newbie Trekky but my partner's a huge fan. I was actually more interested in the fact this was a Haynes manual of a fictional machine than in the Star Trek aspect. I'm pretty sure if I was a full on Trekky I'd give this 5 stars. But I was a little disappointed that it's a Haynes manual in name and cover style only. The content is amazing but I was hoping for some old school Haynes design. A Christmas gift that I have dipped in and out of (mainly because I left it at my parents' house). Geeky technical love. This is a gorgeous guide to our favourite starship, in all its incarnations...it makes a wonderful companion to all the other tech manuals...and rivals the DS9 tech manual for sheer gorgeous artistic layout. Now that Star Trek has turned a page with the reboot, this is the perfect final summary on the original saga of the Enterprise and its universe. Excellent pictures with some continuity information I found intriguing (so what did happen to the Enterprise-B?). This is a must-have for all Trek fans. The half-star off is because, despite the title, there's nothing in the book resembling a real Haynes manual. But otherwise, this book is ship-geek nerdvana. Lots of detail about all seven versions of the Enterprise. Not many specs, but lots of images and explanation. Much more technical than I expected. Lots of complex engineering and scientific data, thoroughly researched down to measurements and operating systems - all fiction. Remarkable in its way. The universal translator still doesn't make any sense but I understand warp drives a lot better now. Not as in-depth as Okuda and Sternbach's original guide to the Enterprise-D, but it covers all Star Trek ships that had the name. It's a fun book, and stands as a good companion to the original. A neat read for moderate fans of Star Trek. I've read that some fans think this isn't enough information or was just repeated from other places - but I've never seen this stuff before. I was hoping for more technical and less discussion of Star Trek operations and basic background of the Star Trek universe. It is still a lot of fun to own and flip through. Ridiculous amount of detail. Lots of in-jokes for science geeks. Too nerdly for me, I'm afraid. Like all the techno-babble in one perfect package!